For this month's "Maps Of The Month" featurette, I wish to draw your attention to TerraEsperZ's The Immortal (NES) maps. In The Immortal, you are on a quest to rescue your teacher, the wizard Mordramir, apparently trapped deep within a dungeon. You must really think highly of Mordramir to take on this dungeon, where danger lies around every corner, and you will surely die, a lot. Bats and goblins and giant worms and a dragon, not to mention a multitude of traps, stand between you and the end of your quest. But hey, it's a neat-looking dungeon, in the rare isometric perspective and distinctive graphics (certainly unique, on the NES at least). The NES has many difficult games, and some notoriously so, but TerraEsperZ is no stranger to them (we're talking about the guy who mapped Battletoads, after all). Not only has TerraEsperZ managed to map this whole dungeon, he's done it in two flavours: either without spoilers, or with the secrets and traps indicated. You just might survive after all (maybe), thanks to TerraEsperZ, the first mapper to receive the Maps Of The Month honour ten times! Congratulations! 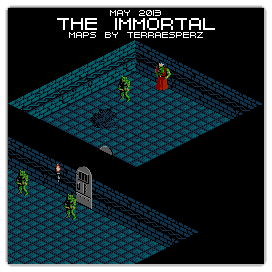 So to acknowledge the effort put into immortalizing this infamously difficult game, TerraEsperZ's The Immortal (NES) maps will be known as VGMaps.com's Maps Of The Month for May 2013. Gotta love some isometric maps! Doesn't look like there's a whole lot to the game, even by NES standards, but great maps nonetheless! Now I just need to stop seeing the title as "My Immortal". Yeah, it really takes playing through the game to realize how small it actually is. It's really the countless traps and puzzles that extend its length. 1) The original (Apple IIGS) and it's direct ports (Amiga, Atari ST). This one can be recognized by the fact that at any time, you can see the outline of surrounding rooms and that combat is done in the same game mode as the rest of the game. Also, all rooms have the same tileset as well as colors, and the music in general is... strange. It never really feels like separate songs or themes and at times, can sound quite cacophonic. 2) The Sega Genesis and MS-DOS ports. Unlike 1), you can't see anything outside of the current room and combat is now more involved, being done on a separate screen with enemies having more health. The music is completely different but I think it sounds much better, with distinct themes corresponding to rooms and events (the Genesis has the upper hand with better sound overall and the music following events more closely). Interestingly, the Genesis port has some rooms with a different tileset for variety (showing a polished stone floor instead of bricks). Overall, the actual gameplay (fights aside) is pretty much identical to the original game. 3) The NES port. It's pretty much unique and more has been altered than before thanks to the limitations of the NES for one, and to include more action. On the graphics side, the sprites are smaller which creates an impression that the rooms are much larger. Also, although the NES palette is more limited than all the other systems, there are now three different color schemes for the various rooms (blue, red and gold). Gameplay-wise, there is now a tiny bat that appears out of nowhere if you sit idle for more than a few seconds that will sap your life very quickly unless you shoot it down with a fireball. Oh yeah, you can shoot tiny fireballs at will now but they're only useful against those annoying bats and to light torches in Level 1. Speaking of levels, the first one has also been altered the most, with tons of fire traps in the second room and a missing door from there to the room with a giant hole in the floor, and the pile of hay being moved to an additional room down the ladder that would normally end the stage. Items-wise, fireball scrolls are now gone (preventing you from instantly killing enemies from afar) as well as a map showing the location of the hidden pits (now only shown in the game's instruction manual). Level 6 (the spider nest) is completely gone and a few of the earlier rooms in level 3 that are down ladders have been switched around. The fight against Ulindor right before confronting the Norlac is also gone and the final battle against Mordamir is a bit easier. The soundtrack, although based of the themes of the Genesis version, has some additional songs and they're not always played in the same places or during the same events. In any case, the sound chip of the NES makes almost everything sound much better even if it's missing the engaging music the Genesis port features during the final battle. All in all, mapping this game has been a strange yet exhilarating experience rooted in nostalgia. I first read about it in a very old Nintendo Power issue at about the same time I watched the old GamePro game show offer tips for the dragon fight on the Genesis. The music during the fight sounded so good back then! I remember all the maps in that NP issue and being so curious to know how that mysterious Norlac water monster looked like from its stage preview. I imagined an entire level flooded in water instead of a single room and, well, the whole game appeared much longer and involved at that age than it did when I finally played through it. I was actually very disappointed to realize that every level after the fifth was so small. I'm really happy with how the maps turned out. All the rooms fit together perfectly and I managed to point out all the traps and secrets exactly how I imagined (which almost never happens). I can't remember if this project took me longer from starting date to finishing date than the Battletoads one, but if not, it sure comes close. I don't think I'd recommend the game given how frustrating it is and how little replay value it has, but you could certainly sit through a Let's Play of both the Genesis and the NES versions. The music is good and the story, from what little is there, is actually interesting and not too clichÃ©.